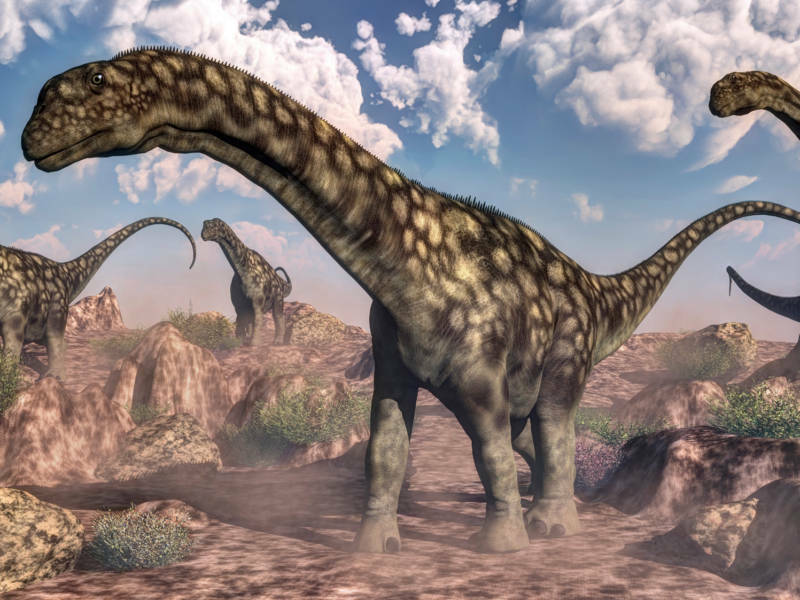 If there ever was a "nice" dinosaur, it would be the sauropod. In dinosaur movies, they're the plant-eating giants with impossibly long necks and big, cowlike eyes. Paleontologist Michael D'Emic cut his professional teeth on sauropod bones. "If you want to study sauropods," he says matter-of-factly, "you need help. A forklift, assistants." A sauropod could grow to be 120 feet long and weigh more than a humpback whale, and carry all that on four legs. D'Emic finds them fascinating: "What can nature do and how does it do it at the biggest of scales?" is the question he thinks the sauropod can answer. D'Emic put sauropod bones under a microscope and in a CT scanner at Adelphi University, where he works. Not just any sauropod, but a baby that hatched and died within weeks — an extremely rare find. He learned, and published in the journal Science, that this guy grew quickly. "It grew right out of the gate, roaring out of the gate," D'Emic says, "extremely fast." A unique ring in the interior of a bone marked the time the animal hatched, and how big it was: about 7 pounds. Growth marks after that recorded how fast it grew. "And by the time it died just several weeks later," D'Emic says, "it was weighing upwards of 80 or 90 pounds — a Chihuahua to a Great Dane in six or seven weeks." D'Emic says growing fast would have been a good strategy when size is your best defense against predators. He says the discovery is part of a renaissance in sauropod research lately — lots of new fossils are turning up. The most spectacular is arguably the most complete sauropod skull ever found, uncovered in Argentina. "The head is the most important part to have" from a dinosaur, says Matt Lamanna, a paleontologist with the Carnegie Museum of Natural History in Pittsburgh. He's a member of the team that studied the skull. He says the skull is the Rosetta Stone for understanding behavior: "You know, how it fed, what the brain was like, what the senses were like ... what made the animal tick." The team called this new species sarmientosaurus, a member of a subgroup of sauropods called titanosaurs. They describe their 19-year study of the animal in the journal PLOS One. They did a CT scan of the skull, and in a sort of reverse engineering, they figured out what the brain and sense organs must have looked like. "For instance, the middle ear seems to adapted for hearing low-frequency sounds; whatever that means, we're not totally sure," Lamanna says. Modern-day elephants and whales communicate with low-frequency sound, which could provide a clue. The orientation of the organs of the inner ear suggest the animal's normal posture was "neck down," which could mean it browsed not on treetops but on ground vegetation. Taken together, Lamanna says, these discoveries are finally revealing the secrets of the dinosaur age's ultimate survivors (not counting modern birds, which descended from dinosaurs). For about 150 million years, they were too big to fail.